Alexander Clayhills was a prominent local landowner. He inherited the estates of Invergowrie with its mansion house and extensive landholdings. He was a charitable man, involved in many fundraisers and various committees in Dundee. Episcopalian: Alexander Clayhills was described as having been 'a munificent contributor to the Church' (St Paul's Episcopal Chapel): He also seconded the proposal of Sir John Ogilvy, that the Right Reverend Bishop Forbes be appointed to fill the vacancy, caused by the demise of the Very Reverend Dean Horsley, in the collegiate charge of the Chapel in 1847: The Very Reverend Dean Horsley was buried in the Clayhills family ground at the Old Church at Invergowrie. Alexander Clayhills also donated two windows to the new Cathedral Church of St Paul's in memory of his mother, Henrietta Henderson Kinloch. Subscriber 28 – Right Reverend the Bishop of Brechin – Alexander Clayhills had been instrumental in the appointment of Alexander Penrose Forbes to St Paul’s. Subscriber 47 – John Cooper – James Cooper (or Coupar), John’s father, undertook the management of Invergowrie Home Farm when John was a boy. Subscriber 64 – Messrs Don Brothers – William Gilbert Don and John Don were cousins of Alexander Clayhill’s wife, Elizabeth Hunter. Subscriber 86 – John A Gloag – agent, factor, trustee and beneficiary of Alexander Clayhills. Alexander Clayhills was born in Yorkshire in 1796. He spent some of his early years in the army. The name of Alexander Clayhills appeared on the 'Waterloo Roll Call' of the 23rd Regiment of the Foot (or Royal Welsh Fusiliers). At the age of 16 years, he was listed as a 1st Lieutenant, as of 17 September 1812. It was then declared that he was 'Placed on h.(alf) p.(ay) as lt.(lieutenant), 67th Regt. 30th May 1822. 2nd son of James Menzies-Clayhills, of Invergowrie, co. Forfar. M. Elizabeth, day of Gen. Hunter, of Burnside, and d.s.p. 18th June 1865.' Following the death of his father, James, in 1825, he inherited the estate of Invergowrie, and with it, numerous lands and farms in the area, which had long been in the possession of his family. Alexander Clayhills of Invergowrie (b. 14 Jan 1796; d. 18 June 1865) was the second child of James Menzies Clayhills (1753-1825) and Henrietta Henderson Kinloch (1764-1861). The couple married in Edinburgh on 4th Dec 1785. Alexander Clayhills was born in Richmond, Near Leyburn, Yorkshire. He had two brothers, James Menzies Clayhills (1786-1817) and George Dunbar Clayhills-Henderson (1798-1861). He also had 3 sisters, none of whom married. In his early years, as a young man, Alexander Clayhills became a Lieutenant in the 23rd Royal Welsh Fusiliers, being placed on half pay by 1822. 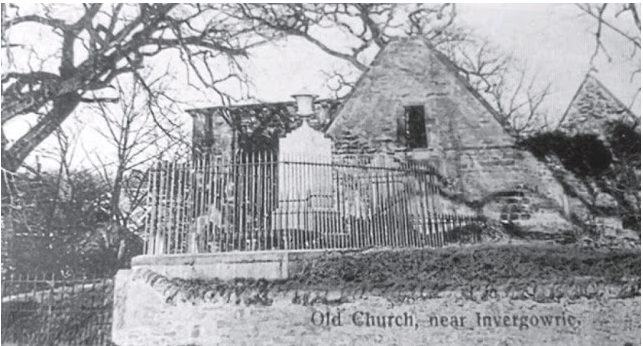 In 1826, Alexander Clayhills married Elizabeth Hunter (1805-1879), daughter of General David Hunter of Burnside (born 1768 in the parish of Monifieth -1846) and Margaret Douglas (unknown dates). Her parents married on 1st/2nd of June 1794. Alexander Clayhills and his wife, Elizabeth had no known children. This was also the case in 1837-38, when he resided on the south side of the Nethergate, Dundee. By 1856, he was living at Invergowrie House with his wife, Elizabeth and, as proprietor of the estate, he had considerable land holdings in Invergowrie, Broughty Ferry, Menzieshill and Ninewells. The family of ‘Clayhills of Invergowrie‘ has a long history going back to the 17th century, although not in a direct line. They include prominent merchants in Dundee and members of the Guildry Incorporation. In the 18th century, the male line died out and one of the family of ‘Menzies of Menzieshill‘ acquired the estate through marriage, changing his name to Clayhills as he did so. The lands of Menzieshill became part of the Clayhills’ estate. Alexander Clayhills was a Justice of the Peace for the Dundee District of the County of Angus. Through this, he was involved in the establishment of a Patriotic Fund for the Widows and Orphans of Fallen Soldiers in 1854. His charitable works were numerous. In the previous year, he had been a subscriber to the Dundee Public Buildings Association. He was a Harbour Trustee, as well as assisting in the proceedings involved in the building of a Corn Exchange and People’s Hall for Dundee, in 1856. He was also involved with the collection of subscriptions for a memorial to the Prince Consort in 1862. 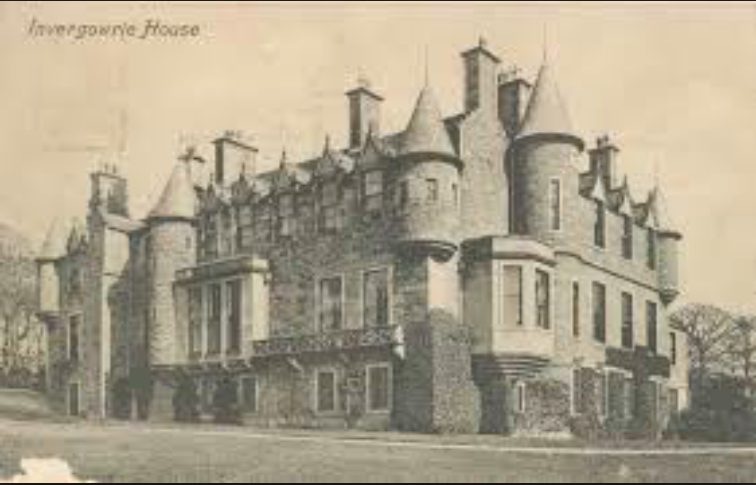 In 1860, it was reported that ‘Alexander Clayhills Esq and Mrs Clayhills have returned to Invergowrie House after nearly 2 years residence in Devonshire’ – a lengthy sojourn. The report did not stipulate the reasons for their having gone from Invergowrie to Devon, although they (then in their 60s) may have wished to be closer to Alexander’s remaining family members – his brother George and sisters, Margaret, Isabella and Cecilia were all resident in Budleigh Salterton on the Jurassic coast. Alexander was predeceased by George and Isabella in 1861 and 1863 respectively at Budleigh Salterton. Alexander Clayhills died 18 June 1865, at the age of 69, at Invergowrie House. His obituary appeared in the Dundee Advertiser on 19 June 1865, and notices of his death were found in naval and military publications. He was survived by his wife, Elizabeth Clayhills and two sisters, Margaret and Cecilia, having been predeceased by his brothers James and George and his sister, Isabella. Jervise, Andrew. 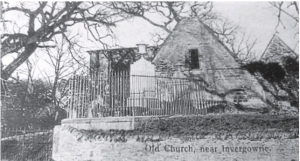 Burial Grounds & Old Buildings in the North East of Scotland. Epitaphs & Inscriptions. 1875. Edinburgh. Edmonston & Douglas. p.193-194. England Select Births and Christenings, 1538-1975. Richmond, York. (1796). FHL Folm Number: 207570, 207571. Ancestry website. Census Records. Leamington Priors, Warwickshire. (1851). Class: HO107; Piece: 2072; Folio: 173; Page: 3; GSU roll: 87337-87338. Ancestry website. Old Parish Registers. Marriages. Dundee. (1826). 282/ 210 191. ScotlandsPeople website. Statutory Registers. Liff & Benvie. Deaths. (1865). 301/11. ScotlandsPeople website. Dundee Advertiser. 3 December 1865. p.3. British Newspaper Archive website. Caledonian Mercury. 15 November 1847. p.3. British Newspaper Archive website. Dundee Evening Telegraph. 9 December 1896. p.4. British Newspaper Archive website. Provincial Grand Lodge of Forfarshire website. Information supplied by Iain D. McIntosh, Friends of Dundee City Archives, from the records of the Provincial Grand Lodge of Forfarshire. Perthshire Courier. 20 July 1843. p.2. British Newspaper Archive website. Dundee Courier. 22 June 1847. p.3. British Newspaper Archive website. Dundee, Perth & Cupar Advertiser. 12 December 1848. p.2. British Newspaper Archive website. Dundee Courier. 20 December 1848. p.3. British Newspaper Archive website. Montrose, Arbroath & Brechin Review. 16 June 1854. p.7. British Newspaper Archive website. Edinburgh Evening Courant. 10 May 1828. p.2. British Newspaper Archive website. Valuation Rolls. (1855). ScotlandsPeople website. The Waterloo Roll Call. royal welsh.org.uk website. Legal Records. Wills and Testaments. Forfar Sheriff Court. (1825). SC/47/40/2. ScotlandsPeople website. Printed abstracts of Registers of Sasines for Forfarshire. 16 April 1828. Dundee City Archives. Legal Records. Wills and Testaments. Dundee Sheriff Court. (1865). SC45/ 31 19. ScotlandsPeople website. Dundee Directory, 1829-30. p.18. Dundee Central Library, Local Studies. Alexander J Warden: Angus or Forfarshire. (1884). Dundee. George Alexander & Co.
Dundee Directory, 1842-43. p.103. National Library of Scotland website. Dundee Courier. 29 November 1854. British Newspaper Archive website. Dundee Courier. 1 May 1853. British Newspaper Archive website. Dundee Directory, 1842-43. p.104. National Library of Scotland websitee. Dundee Courier. 27 February 1856. British Newspaper Archive website. Dundee Courier. 21 May 1862. British Newspaper Archive website. Dundee People's Journal. 19 May 1860. p.3. British Newspaper Archive website. Dundee Directory, 1837-38. p.17. Dundee Central Library, Local Studies. Thanks to Iain D. McIntosh, Friends of Dundee City Archives, for information on Alexander Clayhills and Freemasonry. The information above about Alexander Clayhills has been collated from a range of digital and hard copy sources. To the best of our knowledge it is correct but if you are relying on any information from our website for the purpose of your own research we would advise you to follow up the sources to your own satisfaction. If you are aware of an inaccuracy in our text please do not hesitate to notify us through our Contact page.